Dinosaurs were among the first movie characters. We’ll ‘train’ our dinosaur by making a virtual puppet. This is a simple animation that you control by hitting keys on the keyboard. Each keystroke takes you to a new frame in the animation. By toggling back and forth between the keys you can make your dinosaur talk, eat, turn, tap feet, etc. You can create your own ‘tame dinosaur’ movie by manipulating the dinosaur in response to questions. It can shake its head to answer yes or no, or tap its feet to answer questions – just like a circus horse. Or you can use the animation to make it scary. You can growl as you move the dinosaur’s mouth. It’s up to you. It’s your movie! Open Paint and PowerPoint. Use the ‘Airbrush’ in Paint to make a thick, rough outline. Save this PowerPoint. Now copy this slide using the ‘Slide Sorter View’ and open the second slide you have just created. Lift one of the legs up by using the green ‘Rotation Handle’. When you get the desired rotation, nudge the leg section left and right and up and down to re-connect it to the body. Save. Now you have your first two animation frames. 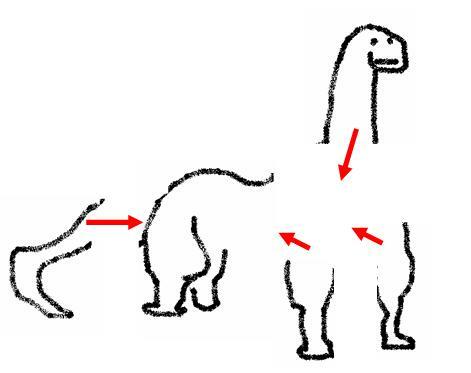 When you are in either ‘Normal’ or ‘Slide Show’ view, you can toggle the ‘page up’ and ‘page down’ keys to make the dinosaur lift and lower its leg. You have a virtual puppet. With this simple 2-frame animation you can talk and make the dinosaur tap answers just like a circus horse –ie- “Dinosaur, how many are 2 + 2?” Tap the leg 4 times. With your camera you could make an entire short film just using this simple animation. Get the dinosaur to answer questions with 1 tap for yes and 2 taps for no and multiple taps for questions with numerical answers. Hello. I’m going to ask you questions. If your answer is yes, tap your foot once. If no, tap twice. How many fingers on my left hand am I holding up? How many eyes does a dinosaur have? How many tails does a dinosaur have? If I add 2 plus 5 then take away 6 how many do I have? Select the closed mouth image and place it in a PowerPoint slide. We now want to position the open mouth in exactly the same spot as the closed mouth was in the first slide. One way to do this is to use the menu command ‘Edit>View Grid & Guides>Display grid on screen’ to line things up exactly. (Don’t forget to turn off the grid after use). Another is to copy the first slide and paste the open mouth image directly on top of the closed mouth. Then use the ‘Draw>Order>Send to Back’ command at lower left to get the closed mouth slide in front. Once your frames are lined up, simply toggle between the two frames with the ‘page up’ and ‘page down’ keys and the dinosaur appears to be speaking. Clearly, dinosaurs did not talk like people. Huge animals have deep voices. So to make a realistic dinosaur in a movie we need to use special effects like Audacity to lower the pitch. (If Audacity is unavailable use Windows Sound Recorder ‘Effects>Decrease Speed’). Using Audacity we highlight the parts of the sound track where the dinosaur is talking or growling. Go to ‘Effect > Change Pitch without Changing Tempo’ and lower the pitch by at least 15%. You can also slow the speed but have to make sure it remains in synch with the animation. Try different pitch and speed changes until you get a realistic growling sound. Save this as a new file and replace the sound track or music track in MovieMaker with this edited file. Software is available that can animate your pictures using a technique of ‘voice synchronisation’. Crazy Talk and Poser are examples of this software. Such software allows you to make your character move its face more realistically in time with your sound track. 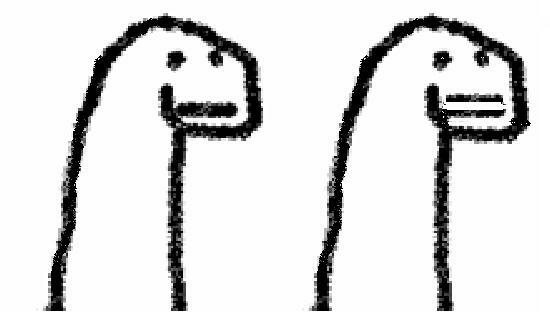 sock puppet dinosaur animated with Crazy Talk software. Animation software such as Kahootz, Poser, Crazy Talk and iClone also have large libraries of ‘canned’ templates for movement, meaning that you don’t have to programme the movement sequences yourself. You can buy libraries of motions that have been captured by professionals. You can combine and edit these to get combinations. 3D sets can also be created or purchased. iClone now allows import of the extensive Google 3D Warehouse. Kahootz imports animated .gifs and image skins (‘swatches’) to create props and custom sets. Common formats such as AVI, Quicktime, and .gif allows footage from all of these programmes to be combined, edited, and given special effects in video-editing software.